Tiago is a passionate family man who loves to fish and is always willing to lend a hand to help others. In October 2015, things changed for his family. Tiago was diagnosed with acute myeloid leukemia and has had to undergo numerous procedures and treatments. This has added a considerable amount of financial stress to his family’s life. Prior to his diagnosis, Tiago and his wife, Ana Margarida, worked side by side at a bakery. Tiago was an enthusiastic baker, while Ana Margarida decorated the cakes. Tiago had to stop working after he was diagnosed, leaving Ana Margarida as the only source of income for their family. With two young children at home, they were in a difficult situation. 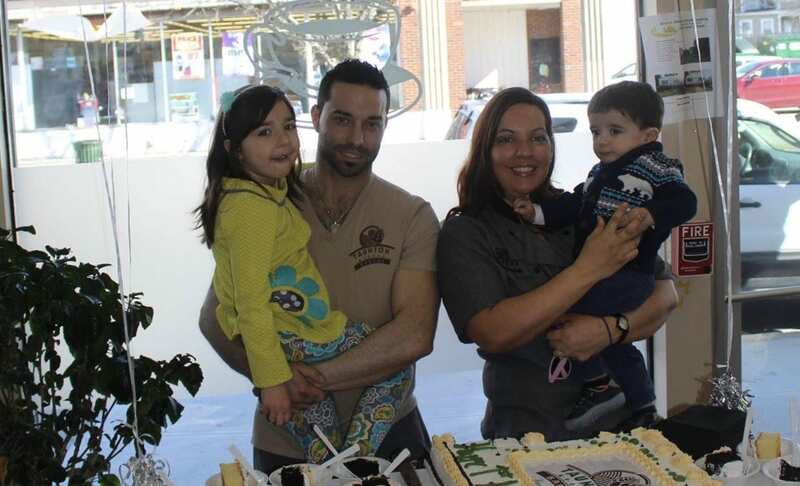 Tiago and his family enjoying cake at their bakery. Tiago and Ana Margarida live in Rhode Island but had to travel to Boston up to twice a week for Tiago’s treatments at the Dana-Farber Cancer Institute. After his stem cell transplant in December 2016, the family made the commute to Boston every day for a month. The combination of gas, food, hospital bills, medication and loss of income devastated Tiago’s family financially. Thanks to the kindhearted supporters of Family Reach, Tiago’s family immediately received a grant that covered everything from childcare to utilities. This allowed them to get back on track. Tiago’s battle is not over yet, but he is staying strong and positive. The family is an integral part of our community and is in our thoughts as Tiago continues to undergo treatment. Help families like Tiago’s stay afloat. Click here to join our Key Holder community today.